This stylish chair was designed for those who love to rock lean back and take comfort in a plush molded foam seat that is 3½" thick x 20"w x 18"d.
* The rocking tension is easy to adjust and can also be locked into the upright position. * The seat tilts automatically as the back rocks with 2-to-1 synchronization. * For every 2° that the back reclines the seat automatically tilts 1°. * Comes complete with padded armrests that are width and height adjustable with seven positions pneumatic height adjustment from 18" to 23" and a 26" diameter reinforced nylon base with hooded casters. 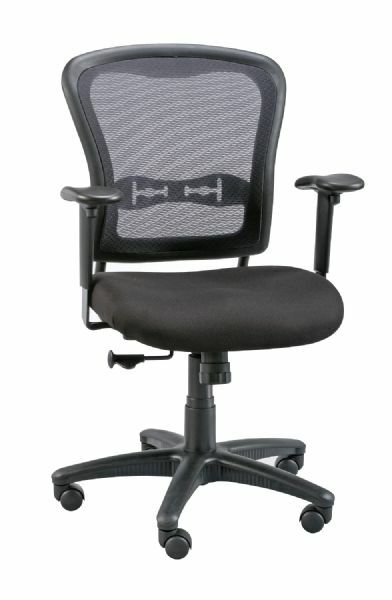 * The tightly-stretched high-grade nylon mesh backrest is depth adjustable 20" wide and rises 21" above the seat. It is arm rest included. The height range is under 24". 27" x 24" x 13"